Champ Car was the name for a class and specification of car used in American Championship Car Racing for many decades, primarily for use in the Indianapolis 500 auto race. Such racing has also been sanctioned by the American Automobile Association, the United States Auto Club (USAC), the Sports Car Club of America, the Championship Racing League, and the Indy Racing League (IRL). In its most popular usage, "Champ Car" was the last name given to a governing body formerly known as Championship Auto Racing Teams, or CART, founded in 1979 by team owners who disagreed with the USAC. At the height of the popularity of the series in 1992, it was known as the CART PPG Indy Car World Series until the split with the Indianapolis Motor Speedway in 1996. Thereafter, it was known as the CART FedEx Championship Series, and in 2003 the Bridgestone Presents The Champ Car World Series Powered By Ford, going bankrupt at the end of the season. A trio of CART team owners purchased the assets of the sanctioning body and renamed it as Champ Car Open Wheel Racing Series, later renaming it to Champ Car World Series (CCWS) LLC. Continuing financial difficulties caused CCWS to file for bankruptcy before its planned 2008 season; its assets were merged into the IRL's IndyCar Series, reuniting both series of American championship open-wheel racing. In 1905 the American Automobile Association (AAA) established the national driving championship and became the first sanctioning body for auto racing in the United States. In 1956, the United States Automobile Club (USAC) was founded to take over sanctioning from the AAA, which ceased sanctioning auto racing in the general outrage over motor racing safety that followed the 1955 Le Mans disaster . USAC controlled the championship until 1978, when a split between USAC and some of its car owners prompted the formation of the rival CART series. The split from USAC was spurred by a group of activist car owners who had grown disenchanted with what they saw as an inept sanctioning body. Complaining of poor promotion and small purses, this group coalesced around Dan Gurney who, in early 1978, wrote what came to be known as the "Gurney White Paper," the blueprint for an organization called Championship Auto Racing Teams. Gurney took his inspiration from the improvements Bernie Ecclestone had forced on Formula One (F1) with his creation of the Formula One Constructors Association. The White Paper called for the owners to form CART as an advocacy group to promote USAC's national championship, doing the job where the sanctioning body would not. The group would also work to negotiate television rights and race purses, and ideally hold seats on USAC's governing body. Gurney, joined by other leading team owners such Carl Hogan, Roger Penske, and U.E. "Pat" Patrick, took their requests, which included larger representation on the USAC Board of Directors, to USAC's Board, but the proposal was rejected in November 1978. USAC's rejection of the proposal led the owners to form a new series (CART) in late 1978 under the principles laid out in the Gurney White Paper, with the first race being held in March 1979. The newness of the organization, however, prevented it from being recognized by ACCUS, the United States representative to the FIA. An arrangement was reached with the Sports Car Club of America (SCCA) where the SCCA would act as the sanctioning body for the new series. This would allow the events to be listed on the International Motorsports Calendar. The new series quickly gained the support of the majority of team and track owners, with the only notable holdout being A.J. Foyt. This meant that the front and mid-pack teams would be racing in the new CART series. Of the 20 races held in 1979, 13 were part of the 1979 CART Championship. Of the 10 tracks to host races, 5 would host CART events exclusively and one, Ontario Motor Speedway , would host races from both series. CART, like its predecessor USAC, was dominated by North American drivers until the 1990s. Many road racing stars, including Mario Andretti, Bobby Rahal, and Danny Sullivan found success in the series. After former F1 champion Emerson Fittipaldi won the series title in 1989, however, additional drivers from South America and Europe joined the series. British driver Nigel Mansell, the 1992 F1 Driver's Champion, switched to CART in 1993 and beat Emerson Fittipaldi for the championship. Mansell's victory, coupled with 1991 CART champion Michael Andretti's failed sojourn into F1, was seen by many as evidence of the superiority of non-US drivers. Former F1 driver Alex Zanardi who was much less accomplished than Mansell or Fittipaldi in F1 dominated the 1997 and 1998 seasons. His teammate Jimmy Vasser, who won the 1996 championship, was the last American series champion. During this time, CART found success in street races, taking over the Detroit Grand Prix and the Long Beach Grand Prix from Formula One, as well as having success in venues like Miami , Toronto , Vancouver , Cleveland , and Surfer's Paradise. They also founded the first full-time driver safety team that traveled with the series, instead of depending on local staff provided by promoters. In 1991, Tony George, President of the Indianapolis Motor Speedway , approached the CART board of directors, proposing a new board consisting of representatives of the series' tracks, team owners and suppliers. Rebuffed by some members of the CART board, George took a non-voting position on the CART board. George later expressed his concerns about restrictive engine leases and capricious rule enforcements (e.g. 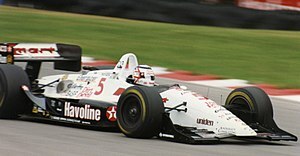 the banning of the carbon fibre tub introduced by March in 1991, ostensibly for safety reasons, until the two CART native chassis manufacturers - Penske and Lola - could catch up), and the lack of American drivers in the series (there were only 10 in 1996), a lack of opportunities for American drivers such as Jeff Gordon, CART's move to include more road racing on the schedule, and escalating costs. George also wanted a greater voice for the Indianapolis 500 , held at the Indianapolis Motor Speedway. Although it was clearly CART's flagship event, the Indy 500 was treated as any other race on the schedule, and also awarded the same amount of driver's points. George resigned from the CART Board of Directors and the formation a new racing series, the Indy Racing League (IRL), in 1994 using the building blocks of the Indy 500 / USAC faction as its foundation. With its first race in 1996, the IRL initially included an all-oval schedule, all races on US soil, and mostly American drivers. George all but shut out CART regulars from the 500 by guaranteeing the top 25 drivers in IRL points a spot in the race, leaving only eight of the thirty-three grid positions available to CART regulars. The contrast between the CART teams at Miami versus the IRL teams at Orlando that weekend was stark. Most of the IRL equipment and drivers were non-competitive cast-offs from CART. By contrast, CART featured 4 engine manufacturers, 4 chassis manufacturers, 2 tire companies, large crowds, 28 cars, and large sponsorships. In March 1996, CART filed a lawsuit against the Indianapolis Motor Speedway in an effort to protect their license to the IndyCar mark which the Indianapolis Motor Speedway had attempted to terminate. In April, the Indianapolis Motor Speedway filed a countersuit against CART to prevent them from further use of the mark. Eventually a settlement was reached in which CART agreed to give up the use of the IndyCar mark following the 1996 season and the IRL could not use the name before the end of the 2002 season. In response, CART attempted to create a rival showcase event, the U.S. 500, at Michigan International Speedway on the same day as the Indy 500 in 1996. The race failed to attract network TV coverage, and substantial promotional efforts were required to fill the estimated 80,000 seats at MIS. The race had a disastrous start with a major crash involving many of the cars. The race date was changed for 1997 so it did not run against the Indy 500. The U.S. 500 name was, however, retained through 1999, and affixed to the existing July race at Michigan. CART's next strategy was to hold a race the day before the Indy 500 at Gateway , which also failed to draw attention away from the IRL's most famous race. Tony George's next move was to specify new technical rules for less expensive cars, and "production based" engines that outlawed the CART-spec cars that had been the mainstay of the racea since the late 1970s. CART teams would be forced to purchase different cars if they wanted the chance to qualify for the Indy 500. From 1996 to 1999, few CART teams and drivers competed in the Indy 500. While this situation allowed many American drivers to participate in an event that they might otherwise have been unable to afford, the bitterness of the turbulent political situation, along with the absence of many of the top CART drivers, big-name sponsors, and faster CART-spec cars cast a shadow over the race. It was certainly arguable that to the average fan, the replacement of at least fairly-well-known foreign drivers by almost-unknown American ones was not perceived as a real gain. As a result, the Indy 500 lost considerable prestige. In the early years after the launch of the IRL in 1996, CART seemed to be dominant. It controlled most of the races and most of the "name" drivers, while George's primary (and for a time, only) asset was Indianapolis Motor Speedway and its 500. The 1996 IRL schedule consisted of only three races, including the Indy 500, and many of the drivers were relative unknowns. In 1998, CART went public with its stock, and raised $US100 million in the stock offering. In 2000, Bobby Rahal stepped in as interim president of CART and replaced the PPG Cup (used from 1979–1999) with the Vanderbilt Cup as the series championship trophy. That year, Gil de Ferran of Penske Racing set the world closed-course speed record for a car race at California Speedway in his Marlboro Team Penske Honda at 241.428 mph (388.540 km/h) while qualifying for the season ending million-dollar (pursed to the winner) Marlboro 500. Despite the considerable drag on the car (inherent of the mandated Hanford MkII rear wing used in CART on the superspeedways at that time) the feat was accomplished on the first lap of qualifying. CART dominance seemed relatively unchallenged through 2000. That year, some CART teams began to compete at the Indianapolis 500 , and ultimately switched allegiance to the IRL for the entire season. This was motivated by mismanagement, upset engine manufacturers, and sponsors that desired participation at the Indianapolis 500. In 2000, Chip Ganassi, while still racing in the CART Series, made the decision to return to the Indy 500 with his drivers, the 1996 CART and U.S. 500 champion Jimmy Vasser, and the 1999 CART champion Juan Pablo Montoya. Montoya put on a dominating performance, leading 167 of the 200 laps to win. The defeat was somewhat humiliating for the IRL teams, with the Ganassi team's primary advantage being pit stops that were frequently several seconds quicker than their main rivals. Yet, the real winner in the situation was Tony George, who had brought back one of the CART teams, and its sponsor, to race with the IRL cars. A year later, Roger Penske, historically CART and Indianapolis' most successful team owner, also came back to Indianapolis and won. The turning point for the CART-IRL rivalry may have come in 2001. That year, CART tried to stage a race at the Texas Motor Speedway , the Firestone Firehawk 600. However, unprecedented g-forces brought on by TMS' steep 24-degree banking caused several drivers to experience dizziness and disorientation. CART was unable to slow the cars down in time to run the race safely, and it was postponed and ultimately canceled; this led TMS to sue CART. After it emerged that CART officials had ignored repeated requests to test the cars before the race, the two parties settled for an estimated $5–7 million. CART lost $1.7 million for the last quarter of 2001 due to money spent on the suit. While the sanctioning body was commended by many for choosing not to put its drivers in danger, the cancellation of the race and the ensuing lawsuit was a severe blow to CART's prestige. By November, 2001, journalist Brock Yates predicted that CART would be defunct by the end of 2002. For 2002, Penske and Ganassi became permanent entrants in the IRL, and Andretti Green Racing after the 2002 season, the latter team being co-owned by CART champion Michael Andretti. The Michigan open wheel race – once the U.S. 500, which was created to rival the Indy 500 – became an IRL event for 2002. In 2002, FedEx announced that they would end their title sponsorship of the CART series at the conclusion of the racing season. In another blow, Honda and Toyota switched their engine supply from CART to the IRL after 2002. CART decided to rebrand and reform itself. Beginning in 2003, CART began to promote itself as Bridgestone Presents The Champ Car World Series Powered by Ford. Because of the loss of its title sponsor and two engine providers, CART's shares plummeted to 25¢ (USD) per share. It declared bankruptcy during the 2003 off-season and the assets of CART were liquidated. Tony George made a bid for certain assets of the company, while a trio of CART owners (Gerald Forsythe, Paul Gentilozzi, and Kevin Kalkhoven), along with Dan Pettit, also made a bid, calling their group the Open Wheel Racing Series (OWRS). George's offer was to purchase only select company assets, in an effort to eliminate any series that would rival his Indy Racing League. However, if George's bid (which was actually higher than the OWRS bid) had been successful, many vendors that were still owed money by CART would have not been paid. Therefore, a judge ruled that the OWRS group should be the purchaser of CART, which ensured a 25th anniversary season in 2004, running as Champ Car. Open Wheel Racing Series. (OWRS) would later change its name to Champ Car World Series (CCWS) LLC. Team Rahal moved to the IRL just before the Long Beach GP in 2004. However, several teams stayed with Champ Car, ensuring that the series could continue. Most notable among these was Newman-Haas Racing (now Newman/Haas/Lanigan Racing). The powerful and well-funded team owned by actor Paul Newman and Illinois businessman Carl Haas was adamant on its loyalty to the series and its direction. Another team notable for its loyalty was Dale Coyne Racing, one of the world's oldest continually operating open wheel teams. In 2007, with the withdrawal of Bridgestone and Ford Motor Company as presenting sponsors, the official name of the top-tier series promoted by Champ Car became simply the Champ Car World Series. Rumors and accounts of financial troubles, often reported by respected motor sports reporters, plagued the series all during 2007. By late 2007, it was clear that CCWS lacked the resources to mount another season. Several races in the 2007 season were canceled before they were held, and in fact, the CCWS never had a season where they ran every scheduled race. Rumors and press reports of the financial situation of the series were common, and complicated any future plans. In early February, 2008, the CCWS Board of Managers authorized bankruptcy, to be filed on February 14, 2008. On February 22, 2008, an agreement in principal was reached and signed that merged the Champ Car Series with the IRL. The memorandum sold the CCWS' sanctioning contracts (notably Long Beach) and intangible assets, along with the Champ Car Mobile Medical Unit (at the time known as the Holmatro Safety Team), to the IRL for $6 million. The document also included a non-compete agreement for Forsythe and Kalkhoven in exchange for $2 million each, provided they paid "certain bills" for the Long Beach bills for 2008 and support the IRL. The assets of CCWS were sold at auction on June 3, 2008. In the agreement, the IRL became the owner of all CART and CCWS material and history, so all CART history will become part of the AAA-USAC-IRL history. Therefore, IndyCar events held at traditional CCWS venues (such as Edmonton) are not "inaugural" events, despite press promotions to the contrary. The IRL also picked up the Edmonton and Surfer's Paradise races for 2008, and revived the Toronto race for the 2009 season, albeit under different promoters. Newman/Haas/Lanigan Racing, Dale Coyne Racing, Conquest Racing, HVM Racing (without Minardi), and Pacific Coast Motorsports transitioned to the IndyCar Series in the 2008 season. PKV Racing became KV Racing Technology, which took the Team Australia sponsorship from Walker Racing. Failing to make the transition were Forsythe Racing, Walker Racing (except for a joint program with Vision Racing at Edmonton to run Paul Tracy), and Rocketsports. The first "merged" event was the GAINSCO Auto Insurance Indy 300 from Homestead-Miami Speedway on March 29, 2008. On April 8, 2008, in his first merged IndyCar Series event, Graham Rahal drove his Newman/Haas Racing entry to victory in the Honda Grand Prix of St. Petersburg , marking the first win by a merged team. Due to a scheduling conflict with the IndyCar Series' Motegi event, the Long Beach race was held on April 20, 2008 as an IRL points-paying event using the CCWS-spec DP01 cars, and was contested entirely by CCWS teams. Fuel: Methanol, Mobil 1 lubrication. Four drivers died in CART-sanctioned events. Jim Hickman – (August 1, 1982), Tony Bettenhausen 200, Milwaukee Mile , practice. Jeff Krosnoff – (July 14, 1996), Molson Indy Toronto, Exhibition Place , 3 laps from finish. Gonzalo Rodríguez – (September 11, 1999), Honda Grand Prix of Monterey, Laguna Seca Raceway , qualifying. Greg Moore – (October 31, 1999), Marlboro 500, California Speedway , lap 10.